That’s what happened to extreme athlete Soren Lindholm. On March 4, 2017, he fractured his spine in an advanced terrain ski race and was paralyzed from the waist down. In October, 2017 Soren began Neuroplastic Functional Training for his spinal cord injury (SCI). Today, he is running in the swimming pool. Imagine it happening for others with spinal cord injuries. No, it’s not a miracle...it’s a new practice from the Neuroplastic Functional Institute (NFI), a cutting-edge technique that teaches people how to change their brains so they can independently heal. 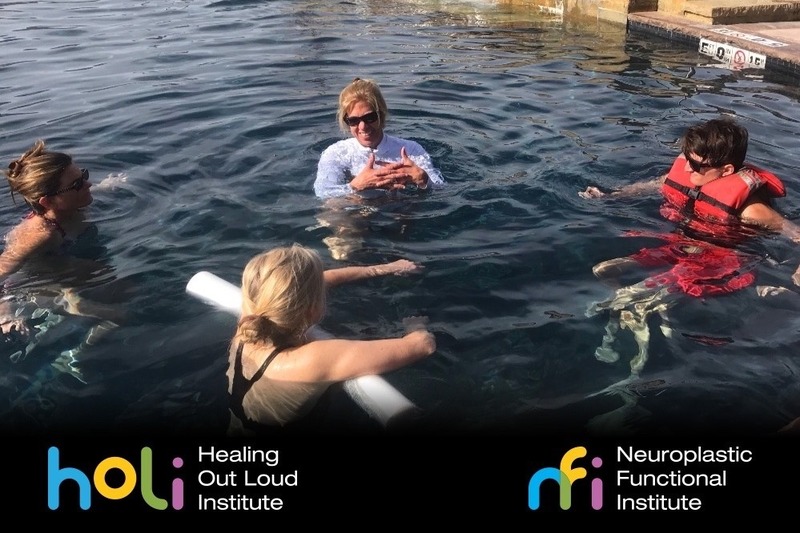 Realizing that a number of people with spinal cord injuries (SCI) are underserved and financially challenged, NFI launched a not-for-profit organization called the Healing Out Loud Institute (HOLI). Their hope is that people will join them and help provide skills that promote independent healing to this population. That’s the plan of The Healing Out Loud Institute...with your help. The Healing Out Loud Institute is a small, multidisciplinary collective of healthcare professionals dedicated to providing pain-free, lifelong, high-level function for the whole person. Based on the science that the brain is not hardwired or fixed, but can change its structure and function, HOLI educates the brain for health and performance to advance body, soul, and spirit. Neuroplastic functional skill sets create an opportunity for freedom in every area of life, especially for people with spinal cord injuries (SCIs). We have a vision...a crucial vision. There are many underserved candidates that can benefit from this work. We understand that individuals with physical impairments often times have monetary challenges. Please donate now, so we can begin Connecting people with spinal cord injuries and healthcare professionals with Neuroplastic Functional Training. For more information check out our website NFIHeals.com and learn more about Lauryn Maloney-Gepfert and the rest of the team. Want to see the results of HOLI’s good work? Click on the 16-second film of Soren Lindholm running in the water. Then, click on the Donate Now button, so we can share our program with many more people with SCI like him. Lauryn is a graduate of the Yale University School of Medicine and is nationally certified as a Physician Assistant. Additionally, she holds both a MFA in Movement/Kinesiology from the University of Utah and a BA in Creative and Performing Arts from Franklin Pierce University. With 38 years as a licensed massage therapist, Lauryn has learned and practiced numerous bodywork techniques. Using these skill sets, she has also owned and operated several businesses, including Body Therapy Systems, a movement education practice; Ergonomic Interventions, a corporate ergonomic analysis and training practice; and Cross Therapy: Healing in Motion, a physical therapy and wellness center. Concentrating on education and rehabilitative, musculoskeletal medicine, Lauryn specializes in the integration of allopathic (traditional) and holistic medicine. She is dedicated to providing people with an education that promotes pain-free, lifelong, high-level function for the whole person. Since 1977, Lauryn has developed a cutting-edge specialty called Neuroplastic Functional Training (NFT). This practice combines the disciplines of neuroplasticity, kinesiology, and life education. Currently, she is the owner and executive director of the Neuroplastic Functional Institute (NFI). Realizing that a number of her students and clients are underserved and financially challenged, Lauryn started a not-for-profit charitable arm of NFI called the Healing Out Loud Institute (HOLI). This organization raises money and hosts events free of charge for impaired participants. Lauryn’s greatest passion is to inspire people to commit to learning how to love, heal, and enjoy total freedom. When asked what she is proudest of, she will tell you it’s her daughter Emma and her stepson Bradlee.